Happy Monday! I am recovering from a wonderful Mother’s Day weekend that included a trip to local winery, a visit to my husband’s parents and the best nap ever! We topped off the weekend with some Indian food including butter chicken and vegetable pakora. 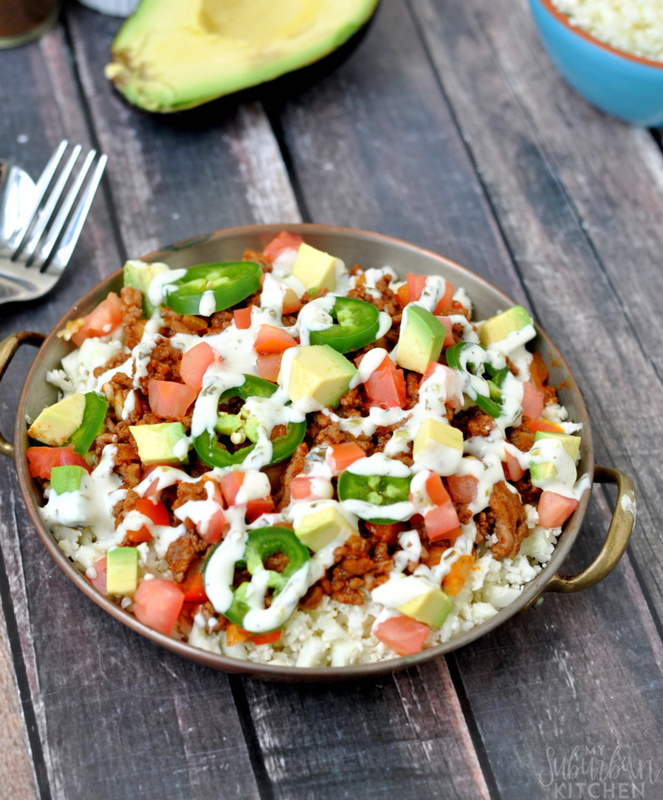 I’m back on track today with a paleo taco bowl on my lunch menu. 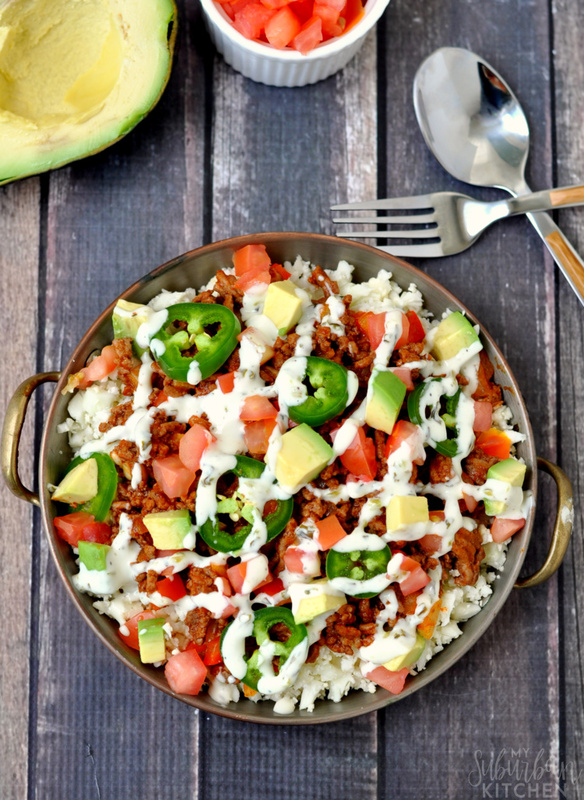 I love taco bowls from Chipotle and over places but the rice, cheese and sour cream aren’t exactly paleo friendly. 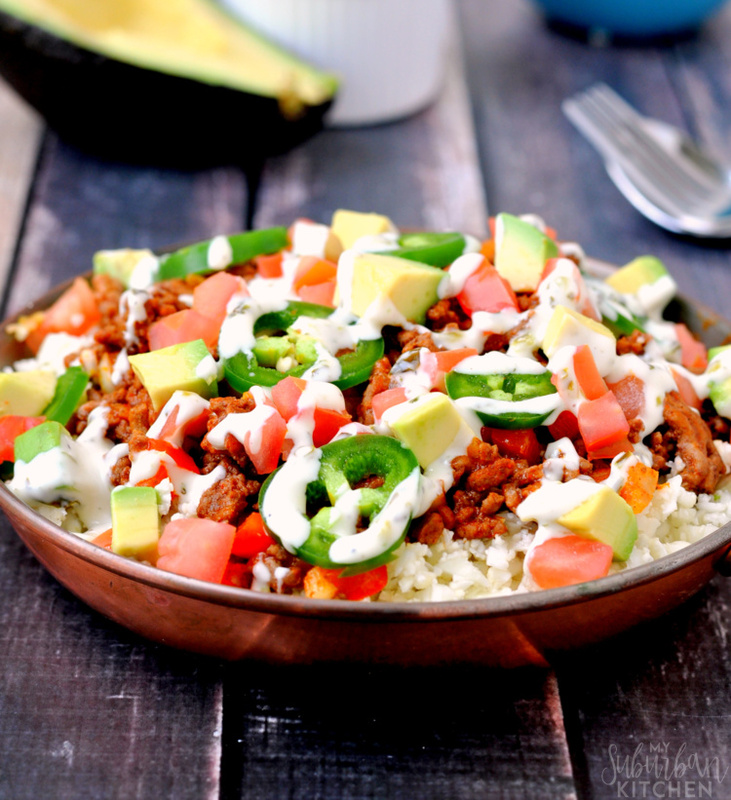 So, for my paleo taco bowl, I substitute the rice with cauliflower rice and include fresh jalapenos, avocado and paleo ranch. 1. Place cauliflower florets in bowl of food processor. Pulse to turn into cauliflower rice. Set aside. 2. Heat large skillet over medium heat. Add ground beef, onion, and bell pepper. Cook, stirring to crumble, for 5-7 minutes or until done. Drain. Stir in taco seasoning and water. Simmer for 10 minutes. Remove from pan. 3. Add cauliflower rice and and cook for 2-3 minutes. 4. Layer cauliflower rice and ground beef mixture. Top with pico de gallo, jalapeno slices, avocado and ranch dressing. 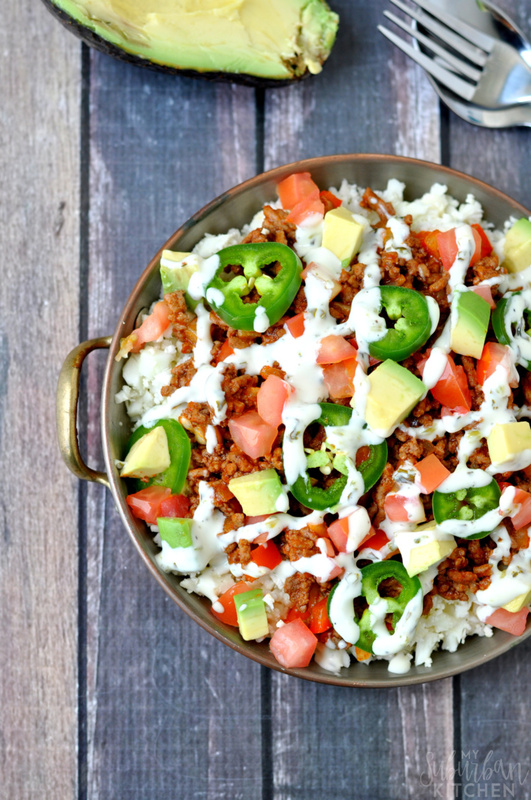 This taco bowl is the absolute best paleo option when you are craving some Tex-mex flavors. I love the fresh avocado on top because it adds the perfect creamy texture to cut through the slight spiciness of the taco mixture. What are your favorite Tex-mex dishes? Have you tried making little substitutes to your favorite dishes to make them healthier? Place cauliflower florets in bowl of food processor. Pulse to turn into cauliflower rice. Set aside. Heat large skillet over medium heat. Add ground beef, onion, and bell pepper. Cook, stirring to crumble, for 5-7 minutes or until done. Drain. Stir in taco seasoning and water. Simmer for 10 minutes. Remove from pan. Add cauliflower rice and and cook for 2-3 minutes. Layer cauliflower rice and ground beef mixture. Top with pico de gallo, jalapeno slices, avocado and ranch dressing. Oooh this looks so tasty! I’m cutting out starches to see if it helps me health, and this looks like the perfect substitute! It looks so good! I’m not sure that the Ranch Dressing would be Paleo though. I’d eat it anyhow! Never thought of adding cauliflower. Sounds really good. Pinning! These look super tasty! I love the creative use of cauliflower!